This episode of the Gunmetal Armory, were going to talk weaponized steel, larger and smaller edged tools, and more. There is a lot that goes into choosing which knife or knives that you’re going to carry in your BOB. There are also multiple considerations to unpack with regards to blade designs, blade grinds, steel types, sheath type, sheath materials, size, handle type, handle materials, and so on. Then, you need to look into Axes, Tomahawks, Hatchets, or something similar for ease of shelter making and many other chores. 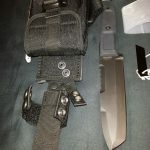 All of the considerations for the Knives must also be applied to axes, multi-tools, machetes, shovels, and so much more. Listen to this broadcast or download “ Survival tools of the Edged Variety” in player below! Then, if we have enough time, we will dive into a new segment I am toying with called “Ask Dane”. In the Ask Dane segment, I will read emails from the Armory email box, and attempt to answer them. The questions are usually all over the place, asking about firearms, old and new, magazine issues, ammo types, ammo performance, edged tools, gunsmithing, fixing broken guns, gear, SERE kits, storing ammo and guns, and a bunch more. Theres no telling what survival related questions Ill get asked and what I will answer. There’s also a giveaway coming up very soon…. This week or next. Be ready as we travel further into the Gunmetal Armory, every Thursday Night at 7pm Pacific (6pm after Daylight savings switches back) only on Prepper Broadcasting Network. Next: Next post: Alternate Sources of Power in Grid Down!